Would Jesus Eat At Chik-fil-A? 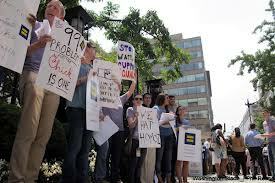 Last Wednesday, the old culture war from the 1980s and 90s was stirred up again. Dan Cathy’s comments to The Baptist Press newspaper were broadcast across the country. His father Truett Cathy founded the Chik-fil-A restaurant chain and Dan serves as the company president and COO. Because the media survives on sound bytes and snippets of information, few if any outlets broadcasted Cathy’s entire interview. And for good reason—readers lose their attention so quickly that few people would read it. Christ never died for a corporation. He died for you and me. In that spirit … [Christianity] is about a personal relationship. Companies are not lost or saved, but certainly individuals are. We are very much supportive of the family, the biblical definition of the family unit. We are a family-owned business, a family-led business, and we are married to our first wives. We give God thanks for that. That’s it. He said nothing about gay marriage in the interview. Nevertheless, Cathy’s words were carried in various media outlets, which led to the media storm and ensuing culture war (to review the sordid events, click here. And last Wednesday, it culminated with “Chick-fil-A Appreciation Day.” Long lines of people showed up at the restaurant to demonstrate their support, the prohibition of gay marriage, and/or the right to free speech. Which begs the question: would Jesus eat at Chik-fil-A? While answering on behalf of Jesus is a risky venture, here’s my guess. Jesus didn’t demand his rights. He laid them down. This is very difficult for any American because our nation was founded on the importance of rights. So my hunch is, Jesus probably would have refrained from eating at Chik-fil-A last Wednesday because the issue was all about rights—the right (or not) to be in a gay marriage and the right to free speech. 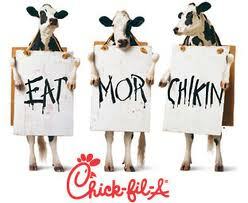 Non-participation in “Chik-fil-A Appreciation Day” is not a demonstration for or against the cause. On the other hand, my hunch is that he would have eaten at Chik-fil-A on Thursday. Why? Because he loves the workers and likely wouldn’t want to see them lose their jobs. Plus, he gave the idea for their amazing chicken sandwiches to Truett Cathy and would probably want to enjoy them from time to time. Brain-washing. One party forces another party to believe and behave in a certain way. Oppression. One party forces another party to behave in a certain way. Tolerance. One party forces another party to accept and approve of certain behaviors. Respect. Both parties agree to disagree on certain behaviors, but act civil-y toward each other. Obviously, these categories break down at some point—especially because I’m operating from the Klassen Dictionary of Terms—but consider Jesus’ words in John 13:34. Love means both parties accept the other party regardless of behavior. Jesus loves the Chik-fil-A workers every bit as much as the advocates of gay marriage. Actually, I think Jesus would have purchased a dozen Chik-fil-A meals on Thursday and shared them with a group of homeless people sitting under a bridge. Or, he would have befriended the protestors and probed their hearts. But he wouldn’t have engaged in any debates because debates rarely have winners and losers. As we witnessed last Wednesday. One note: The Daily Bible Conversation blog is shuttering its doors at the end of August…at least for now. The blog has run its course, so Michael, Eugene, and Brendan will direct their energies in other areas. More news of what’s next will appear in our remaining blogs. Michael co-pastors The Neighborhood Church in Littleton, Colorado with Eugene Scott. He loves, loves, loves Chik-fil-A spicy chicken sandwiches. Very well said Mike!!! And I love Chik-fil-A sandwiches too! Sad to hear about the blog shuttin’ down but all good things must come to an end I suppose. Agree with Carri – well said! I am amazed at how quickly this corporation has been turned into a ‘monster’, and become such a fodder for hate. Sad indicator of the status of our nation. Seems to me the word “hate” is overused. I hate that word! Thanks Georgi-ann for your kind words and consistent, thoughtful comments. I’m going to do something different blog-wise beginning in September–I just need to decide what it is! Thank you, Mike, Eugene and Brendan for your ongoing thought provoking words each day. I have enjoyed clicking onto your blog and will look forward to your new developments. You have done a great job adding a piece of insight to my everyday. Thank you again.